As seems to have become the norm, the day started before dawn. 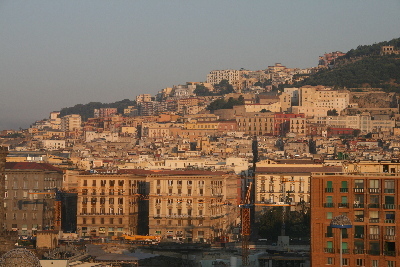 This was our first port of call: Naples, Italy. Since it would be a strenuous day I had a hearty breakfast and then headed up on deck. Thinking we had already docked, I was surprised to find that we were still moving. We were backing very slowly alongside the dock, almost like we were parallel parking. Once we were stopped the crew used a “launch cable” to get the ship's large ropes to the pier to lash us fast; it was very interesting to watch. Soon, though, it was time for the day's excursion so I headed to Epic Theater to meet the rest of the tour group. Shortly after 8am they announced it was time for my tour although there was no sign of Dwight yet. There were about 100 people for the Vesuvius/Pompeii tour and we were split across three buses. I waited until last and ended up on the third bus, number 22 out of all the tours. Luckily just before departure, and in a recurring theme, Dwight showed up at the last minute and we were off. Our tour guide was a lovely Italian woman named Anna Maria who spoke excellent English and was very informative. The drive out of the port is heavily industrialized and it took us a while to get to the Italian equivalent of an expressway. Like America, there was construction and we sat in stop and go traffic for almost 20 minutes until we cleared the area. Before Vesuvius, we visited a local cameo shop where we had the chance to watch a master carving one out of a seashell. There was, of course, a shop where one could purchase cameos. 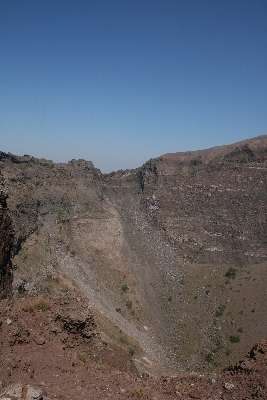 We worked our way back to the highway to continue to Mount Vesuvius. The road that would take us almost to the top was very twisty and there were some hairpin turns that I still can't believe our driver was able to make. It took about a half hour to negotiate our way to the parking area; we would have to walk the rest of the way. The trail to the top is very steep and I had to rest a few times but we eventually made it. The path circles the rim of the crater and the view was spectacular. Despite it being a hazy day, the view of Naples, Capri, the bay and the surrounding area was very impressive. Dwight dawdled a bit as he shopped for souvenirs and we were getting close on time. We headed down, with me leading, as I kept checking my watch. We were supposed to back at the bus by 11:35 and it was already 11:25. I literally left Dwight in the dust as I scurried down the trail; at least going down was easier than going up. I met Anna Maria near the bus at 11:40 with no sign of Dwight. She told me that she was waiting for three more after me so I wasn't the last one, which made me feel a little better. Guess who the last one was, though? You only get one guess. The trip down the mountain in the bus was no faster than the trip up and I was equally impressed with our driver's skill. Pompeii is not far from Vesuvius (obviously) but the trip took about 45 minutes with most of that time used up just getting back to sea level. We were dropped off at an area with several restaurants for lunch while the driver parked the bus. After lunch, Anna Maria led us into the ruins. Words can't adequately describe the feeling of seeing an entire town, nearly 2000 years old, looking almost as it did in 79AD. It's both a little eerie and a little wondrous. There are paved streets with sidewalks and chariot ruts, shops with marble counter tops, theaters with amazing acoustics, steam baths with radiant heating, a city square completely covered with marble tiles, homes with running water and sewer systems, and even a “red-light” district. 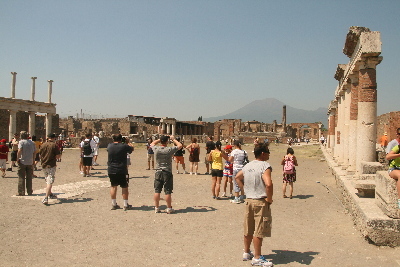 Pompeii is huge and there is still another 1/3 of the town still waiting to be excavated. In the time we had we only saw a small fraction of what is there; it was well worth the visit. After a short break for refreshments (it was very hot) we returned to our bus and the ship. The first order of business was to shower and change since we were both sweaty. Tonight's entertainment started at 5:30 so we had an early dinner; we were both hungry from walking most of the day. This would be something totally different from Peter, a play called I Love You, You're Perfect, Now Change. Actually it was more a set of skits than a play. For those of you old enough to remember, think Love, American Style with each skit representing a step in the chronology of love, from dating to death. It was presented by the Ulster Operatic Company, a group of young performers from Ulster, Ireland. It was quite funny, even hilarious at times. Alex was in the audience for the first act and we chatted briefly before the show started. 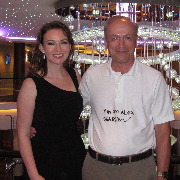 As always, after the show I returned to my favorite place on deck to write this. I actually finished it, too, so I'm managing to stay caught up. That may change tomorrow, though, with a long day in Rome followed by back to back concerts by Alex and Peter, not starting until 8pm. Off to bed now, followed by Roma. My first glimpse of Italy, a view of Naples from the aft deck of the ship. 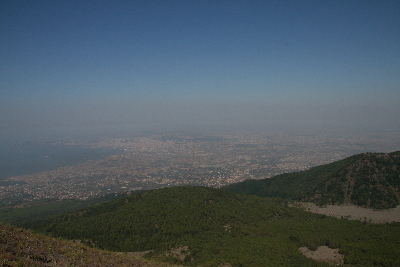 The bay and city of Naples from the top of Mount Vesuvius. 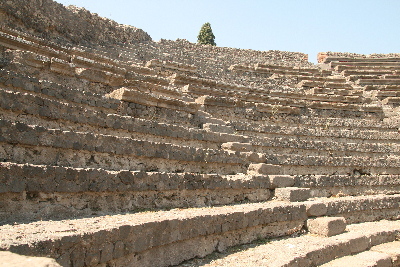 A theater in Pompeii reminiscent of Red Rocks. 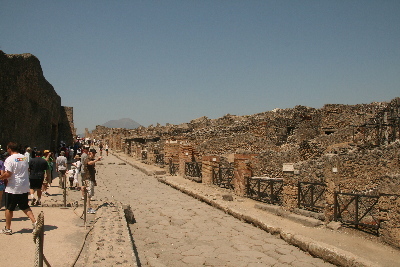 A street lined with shops, notice Mount Vesuvius looming in the background. 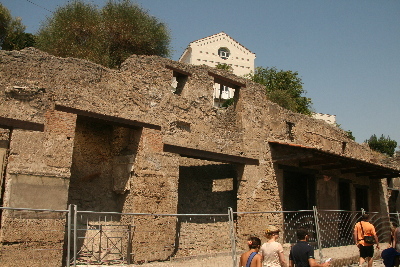 The building in the background sits atop the unexcavated portion of Pompeii. The Pompeii town square, again with an ominous view.